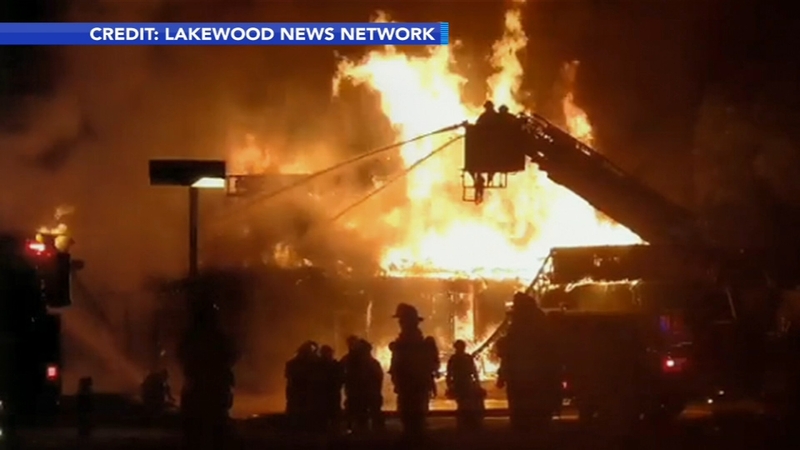 TOMS RIVER, N.J (WPVI) -- A fast-moving fire that destroyed five businesses at a New Jersey strip mall earlier this month has been deemed an accident. The Ocean County Prosecutor's Office announced the finding Wednesday. Investigators determined that the July 9 fire started in the overhang of a dry cleaning business at the Ocean National Plaza in Toms River and soon spread to the other stores. They said a malfunction of energized electrical equipment at the cleaners could not be eliminated as the cause of the blaze. Toms River police say three restaurants were among the businesses destroyed in the blaze, which initially was deemed suspicious. It sent flames shooting high into the sky and was fought for several hours by dozens of firefighters from Toms River and neighboring towns.